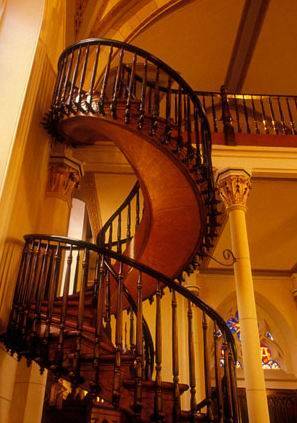 I’m less inspired by the staircase than I am bereaved that it is no longer in a catholic chapel. Please pray for the Sisters of Loretto. Yikes. Boy do they need prayers. No wonder the chapel isn’t Catholic anymore. It would be even less Catholic if this nest of radical feminists and dissenters were in charge. Their identity statement reeks of lesbianism. YOU are the manager of this website and you choose to toss labels around? Are all feminists radical? Are all dissenters automatically abhorrent? You say . . . “reeks of lesbianism” . . . what in the world are you FOR? A follow-up miracle: if the original builders ever got work again after building a loft with no access. What a beautiful staircase — I’ve never seen it before. I know it’s slightly OT (the staircase is amazing) but all you need to know about the Loretto Sisters today is that the Loretto Women’s Network presented the 1995 Mary Rhodes Award to Frances Kissling, head of the pro-abortion group “Catholics for a Free Choice.” Full stop, end of story. the staircase is obviously supported by the ground it is standing on. 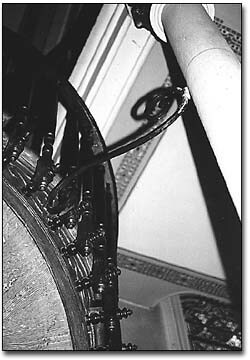 also, the inner helix (inner edge of the staircase + handrail) IS the column supporting it. no wonder here, just people too blind to think. Then can you build for me one like that ? Hey smart guy (St Pertus)! The handrail was a latter addition to the staircase as the nuns found the accent and decent to be a harrowing experience. Even with all the modern high tech woodworking tools we have nowdays, who in this world can make such a superior quality, self supporting staircase made entirely of wood and assembled with just wooden pegs? This was made by one man with no help, using only three basic hand tools; a saw, a square and a hammer. Who among us humans can do that? This was made by Jesus or someone of God with superior intelligence without any doubt. It is a heavenly creation, an absolute work of art. And do you not believe?? Jesus was a carpenter!! How much better at carpentry would he be than us, The staircase is the answer. Far far better and far superior to anything we can do.